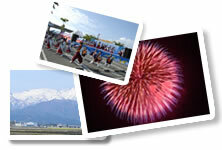 There are plenty of fun events from Hotaruka Fishery to big fireworks festival! Every season, fun events are held throughout the year in Namerikawa City from events unique to the Japan Sea to fireworks festivals. Enjoy the scenery according to the season, enjoy flowers! We recommend Tateyama mountain range at any time. In this boat tour, the sightseeing boat sets off the Namerikawa port – one of the largest fishing port in Toyama - before dawn to off-shore fixed net fishing ground. There, you will have exclusive experience not only viewing mysteriously glowing sea surface and light show of firefly squids but also observing how fishermen actually work. You can enjoy iconic spring dish of local specialty. Try firefly squids at the best season, boiled, grilled, tempura, and more. Instagenic flower festival where 88 kinds, 40,000 plants of Japanese iris come to full bloom in the historic park. Furusato Ryugu Festival is the local summer festival, the largest annual event of Namerikawa city. The festival hosts folk dance performance, firework on the sea, and other events and local foods during the 2 days. On the first day, dance performance of “Niikawa Kodaijn”, traditional folk dance of Namerikawa city, runs through the city at night. On the second day, firework display is held over the sea, where spectacular large 36 inch shell fireworks, the biggest in Toyama, are launched. This is a folk ritual held annually on July 31st to expel evil and wish for health. Gigantic 4-meter torch lights called Nebuta are set on fire and send off to the sea. This ritual has been nationally designated as important intangible folk cultural property. Vietnam Lantern Festival is an instagenic event where traditional Japanese townscape joined with Vietnamese culture creates strikingly exotic atmosphere. This event is held on a summer night around the old post town (Former Miyazaki Sake Brewery) of Namerikawa. 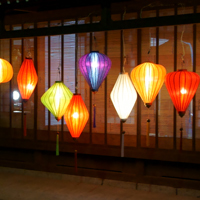 The site is decorated and lit with over 300 lanterns, which evoke the image of Vietnamese port town Hoi An. Food stalls and variety stores are set up to present Vietnamese goods and food such as rice noodle pho and spring rolls. Vietnamese culture is introduced with Ao Dai –Vietnamese traditional clothing – fashion show and its try-on session and Vietnamese folk music concerts.